Shopping for Punisher Action Figures? Features 32 points of articulation, lots of accessories, and interchangeable hands and heads! A great addition to the Mezco Toyz One:12 Collective action figure line! Veteran war hero Frank Castle is back to family is avenge his slain family. With nothing to lose, Frank utilizes his tactical skills to serve justice he deems deserving. Mezco Toyz presents the Punisher Deluxe One:12 Collective Action Figure-Previews Exclusive! Outfitted for war, this deluxe action figure comes with a multitude of extras like weapons and fabric costuming. Made with 32 points of articulation, this highly detailed figure can be customized giving you the most realistic look. 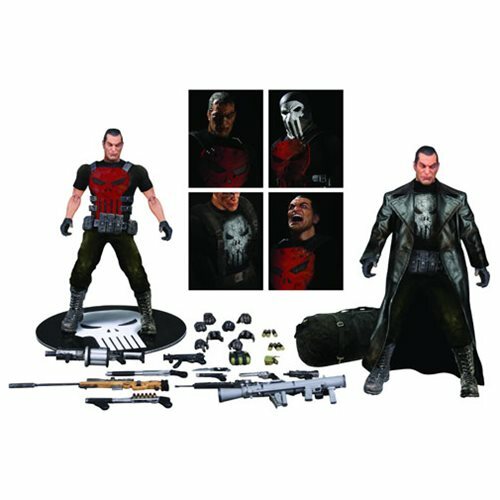 Made with collector's in mind, this Punisher Deluxe One:12 Collective Action Figure-Previews Exclusive comes with a deluxe, fifth panel window box with translucent acetate slipcover for both maximum protection as well as ease of removal for display and measures about 6-inches tall. Figure is in 1:12 scale. Ages 15 and up.